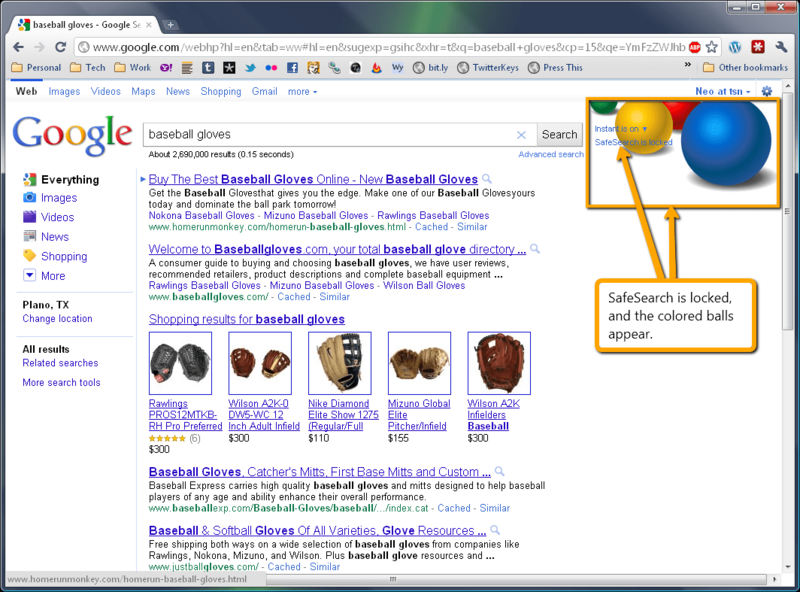 For my images, I did a search on something pretty safe: baseball gloves. It’s clean, work-related, and simple. 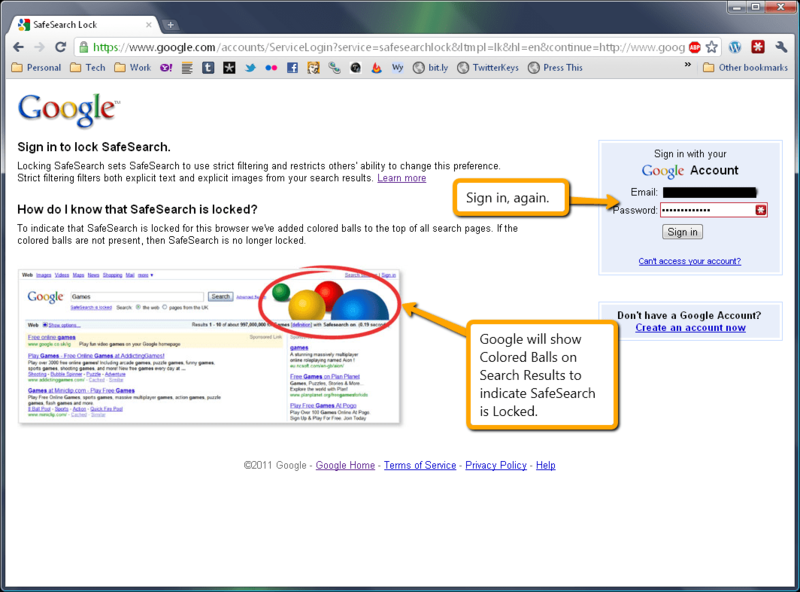 Note the SafeSearch settings (if you’re logged in to Google) in the image below. If you’re not logged in, you should do so, because you’re going to need to edit the Search Settings for your account. 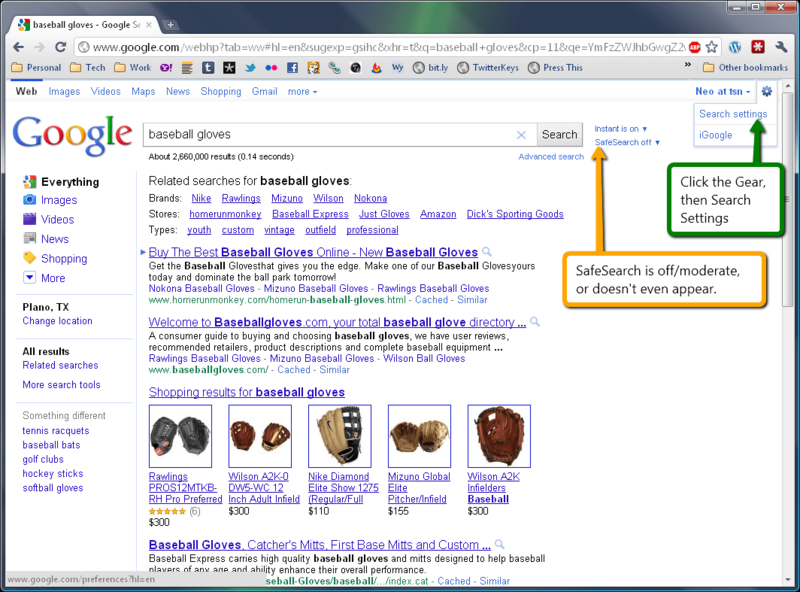 Click the Gear icon in the top-right of your Google Search Results, and then click on Search Settings. You’ll be taken to a page with all the search settings available to you. 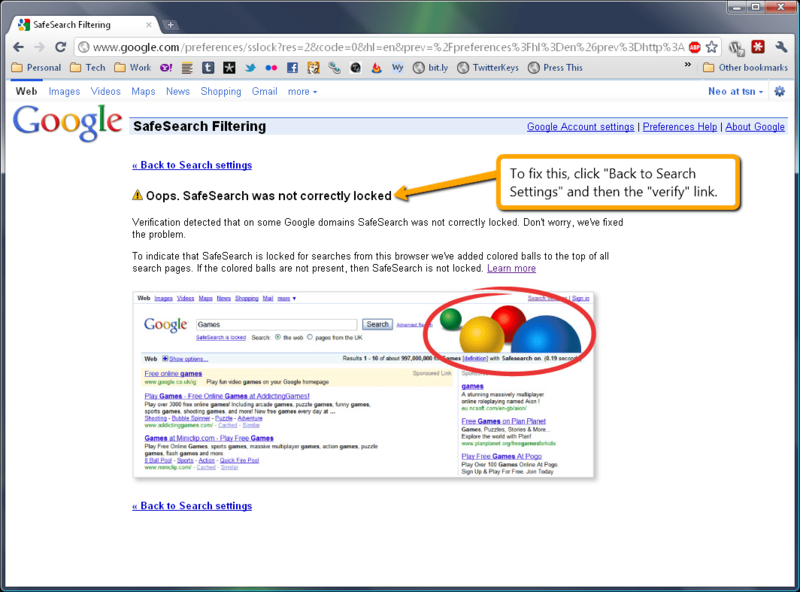 Scroll towards the bottom until you find the section labeled SafeSearch Filtering, like in the image below. You’ll be taken to a Login screen to verify your account. Do it. Also note the text on the left side of the page: Google will place an image of colored balls (like the one at the top of this post) in the upper-right-hand corner of the search results to show that the Lock is in effect. Once you have completed the Verification process (mine never said it was fully locked, and I don’t know which domains were not successful, but Search was fine), test it out. That’s it. If you want to undo this setting, just follow the instructions again from the Verification part of Step 3, but choose Unlock instead of Verify. If I can block spam email, why not spam commercials? I have been running the free trial version and it works. Not just Google but it locks on the family filters for Bing, Yahoo, YouTube and lots of others it seems. The kids haven’t worked out a way round it and they have definitely tried, so I thought others might be interested too. Thanks for the info. I suppose the method I described is just another one of those things that will keep honest people honest.